I was born in bustling Seattle, Washington, the oldest of three sisters, my best friends and staunch supporters, each artistic in their own way. Always drawing, or painting (yes I painted rocks back then), I always seemed to have the itch to create something with my hands (yes I am old enough to have lived and loved through the macramé craze as well) . I married my college sweetheart in 1973, Peruvian born Consul of Peru, Oscar Flores. His love of the arts combined with mine lead to our pursuit of a true artists’ life. I was a weaver and spinner for awhile back then, with sheep that we sheared, bummer lambs in the kitchen, and a huge earth mama garden. 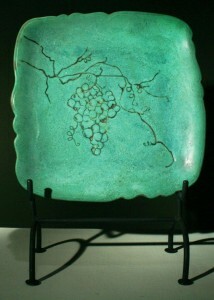 Eventually I moved to ceramics, watercolors and fused glass. My studio space I shared with Oscar got too small (imagine that) and we eventually built a little studio for me on the property, which I promptly filled to the brim. Now thoroughly rooted on eight acres in Eagle Creek, Oregon, we have enjoyed years of creating things inspired by our beautiful surroundings, including the wild-by-design acre sized garden. We have been proud to be members of The Spiral Gallery in Estacada, a real gem in the center of our community. Visitors to our studios are welcome anytime….drivers of low slung cars beware, the driveway is an adventure in itself. Contact Lynn at Hydrangea House Pottery & Glass at 503.637.3373 or hydrangeahousepottery@yahoo.com for private showings and event dates and locations.